Florida, December 2018- Hip Hop Comix N Flix Presents announces the release of The Harlem Shake: Survivor’s Peak by Jeff Carroll. In this, his tenth book, Jeff Carroll takes a group of Black and Latino people to the post-apocalypse. Having attended Gun Shows, read countless Survivor magazines and even talked to a survivalist researching this book to make it authentic, Jeff has practically become a prepper himself. In Harlem Shake: Survivors Peak we find Kenny and his partners a year into their living in the post-world of the earthquake that took out Harlem and the world. Now they are survivors and the new world isn’t finished with them. Having spent the year being trained by a group called The Harlem Survivors they feel ready for anything. When on an exploration outside of their compound takes an unexpected turn they encounter everything else that has survived. Turns out the city of Philadelphia is everything but the city of brotherly love. With the brutal rulers of this new Philly on the scene, all of the surviving world is threatened by their violence. *Survivor’s Peak refers to the point at which a survivor’s preparation supplies run out. Jeff Carroll is pioneering what he calls Hip Hop Sci-fi. This is the second book in his multicultural postapocalyptic series. The first book The Harlem Shake was released in 2016 and has a 100% rating on Amazon. Jeff said he wrote Harlem Shake: Survivor’s Peak to raise the conversation of disaster prep in the Black and multicultural community. In this story Jeff introduces his unique speculation to create new vehicles, weapons and other technology to give readers a genuine post-apocalyptic science fiction experience. 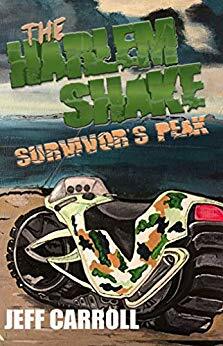 Harlem Shake: Survivor’s Peak (Hip Hop Comix N Flix Presents Paperback, December 18, 2018 $10.00 and Kindle ebook $2.99 ) will scare the world of Hip Hop one hip-hopper at a time with author Jeff Carroll.